As practitioners, or really anyone in a job where you have specific jargon you use on a daily basis that your colleagues all understand – sometimes we forget that you, the reader & the patient, have zero clue what we’re talking about. You look at the website of a Chinese medicine practitioner and you’re like, what is all this stuff?! Also, since I speak Chinese (not bragging here, just stating truth), when I see words like gua sha, I think – oh yeah, gua sha, and it registers in my brain as a thing. You reader, might look at this and spend the next minute trying to figure out how to pronounce it (it’s approximately “GWA-shaw” by the way) and then still have no idea what I’m talking about. I’m excited to explain this to you because we have so many cool tools to use, you should become familiar with them! Gua sha in Chinese means to scrape or bring out the “sha”, which sounds really awful in English and it might look kind of terrible when you’re done, but it’s actually not an unpleasant experience. Most practitioners use some kind of tool like a piece of jade (like the one below) or a soup spoon, one of my teachers uses a jar lid! We make a repetitive motion over the skin with slight force and at first it feels almost like a light massage, and then after a while it starts to get a little warm or sore (I think it feels pretty good!) while we watch the “sha” or little reddish dots & marks (called petechiae if you wanna get fancy) come up. What are these red marks and why does it look terrible??? It is actually not a bruise (just like cupping does not cause bruising) or a cut. In Chinese medicine we look at this as releasing some sort of stagnation, meaning something is not moving in the body that should be moving and so it gets stuck. By doing gua sha, it releases. You know that feeling when you have a really crazy deep itch and you rub and scratch and it feels better? That’s kind of what is happening – you are facilitating a movement of qi and blood in an area that needs a little assistance. So, what is gua sha good for? Gua sha can be used to help at the onset of a cold, tight muscles (like a stiff neck or even on the scalp), fever, headache, various injuries and pain, joint pain, heat exhaustion and more. I have a colleague that loves it during cramping for her cycle and stress-related tension in the scalp! There are people in the community that snuff this practice probably because it’s something they have done in China forever that anyone’s grandma can do (not to diss the grandmas, I love grandmas!). But I still think anything you can do at home, usually going to see a professional is important because we know what we’re doing, we know how it can benefit or harm you, and know the appropriate timing for it. 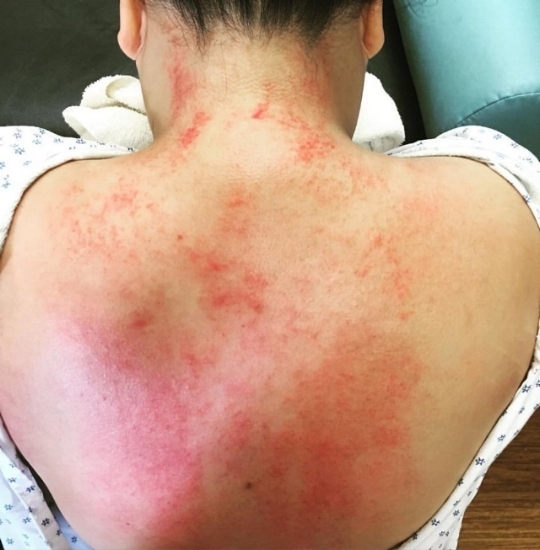 Sometimes patients come into the clinic after learning about this kind of thing and ask me to do it – like someone will come in and ask me to do electro-acupuncture or cupping because they read some article on it and it seemed cool. However, this is generally not how I treat patients – we usually assess what is going on in your body and determine what is right for you. In fact, sometimes if we do something that is not appropriate for your body, you may actually feel worse. So if you’re ever wondering why that might be the case when you go into a clinic, this is why! We are looking out for your best interest and for long-term results. But if you're like, "Hey Angela, I think I'm getting a cold, maybe we could try some gua sha?" I would probably say, "Hey yeah, you read my blog right? That seems appropriate!" :D (And it's perfectly fine if you don't think my jokes are funny).